UCL Mechanical Engineering Senior Research Associate Dr Paul Hellier specialises in exploring future fuel strategies including biofuels. After recently winning additional funding from the EPSRC he spoke to us about tweaking algae, coffee-based energy and tomorrow’s fuels. You have won funding for your project from the EPSRC, please tell us of your plans for your research. My research focuses on how future fuels can be developed from renewable sources with the minimum of post-processing and energy inputs so that these new fuels are truly sustainable, emitting lower levels of greenhouses gases and other pollutants over the whole production to combustion life-cycle. This means that I collaborate with chemists and biologists who are researching new ways of producing fuels to identify those which can be most sustainably produced, and then testing these prototype fuels in the diesel and spark ignition research engines in UCL Mechanical Engineering’s Thermodynamics Laboratory. 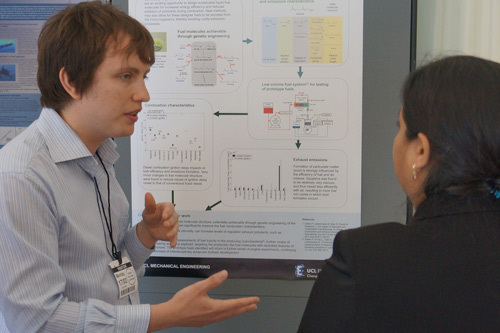 For example, I am working with UCL Molecular Biologists who are genetically engineering micro-algae to produce designer fuels, and from the engine tests of these fuels, which assess the efficiency of combustion and the formation of pollutants like soot and nitrogen oxides, I can provide them with feedback which will help direct the next stages of genetic engineering. This in turn informs my engine experiments, and in this way we can iteratively design fuels on a molecular level that work with modern internal combustion engines and are cleaner burning than current alternative fuels. What exactly will the grant be funding? Some of the potential future sustainable fuels that I will be testing have never been tried (or even considered) as fuels for internal combustion engines before, and while eventually they may be produced from sustainable sources, at present these fuels are very much still prototypes that need to be produced through chemical synthesis. In the Thermodynamics Lab we have novel ultra-low volume fuel systems that allow us to run modern vehicle engines on much smaller quantities than conventionally required (a few hundred millilitres as opposed to ten of litres). However, because these are new fuel designs, even the synthesis of a few hundred millilitres can still cost several thousand pounds. This grant will fund the cost of acquiring these prototype fuels and also help maintain and develop further the specialist research engines and analysis equipment that I will be using. What’s your motivation for researching this particular area? I started out studying Environmental Engineering, and what I found really inspiring was the connections between the big global problems (energy security, climate change, waste disposal) and how engineering can tie these problems together and start to solve them. For example, where food waste is sent to landfill and allowed to decompose, carbon dioxide and methane, both greenhouse gases, are released into the atmosphere, adding to the problem of global warming. If however that same waste is processed in an anaerobic digester and the methane and CO2 collected, this biogas can be used as an energy source to displace fossil fuels. The global demand for energy, and in particular liquid fuels, is expected to continue increasing for many decades to come, and so to be designing new, cleaner fuels that could be produced sustainably, by for instance algae that grows on nutrients from waste waters and CO2 from power station flue gas, is very exciting. What about academic research appeals to you? What I’ve really enjoyed during my time in academic research is the freedom to generate ideas, which may at first sound somewhat crazy or unrealistic, and actually have the opportunity to try these out. I think that UCL is very good at encouraging this kind of curiosity led research, and I have been very fortunate to find like-minded colleagues both within and outside of the department. With collaborators from across UCL, I have investigated unusual concepts like fuelling diesel engines with liquid fuel blends that contain solid algae biomass, and being in academic research provides the independence and facilities to explore these kinds of high risk ideas. You have been doing a fair amount of public science recently. What have some of your most interesting experiences been in this area and what motivates you to venture where some angels fear to tread? A major motivating factor for me is simply that I enjoy talking about my work, and in doing so, to various groups of people, I’ve learnt a lot about how important the broader context of the science should be in directing my research. One of the most interesting projects in which I have been involved has been New Atlantis, an immersive theatre production that ran for a week in January of this year. The show was a vision of 2050 in which the effects of climate change had impacted on the provision of resources such as water and energy, and gave the audience an opportunity to interact with real scientists and engineers whose work may help solve some of these issues. For me, this included demonstrating the combustion of potential future fuels to the audience, highlighting how the design of a fuel on the molecular level can reduce the emissions of pollutants such as soot. The conversations with the audience members that this generated made me realise that many of the concepts I take for granted in my research (such as the difference between renewable fuels and fossil fuels) do still need to be communicated, and can make an important difference to the impact of the very detailed and fundamental research that we do. What would you like to have achieved by 2020? By 2020, I would like to have advanced the scientific understanding of fuel design so that there is widespread realisation that in producing new fuels, we can aim higher than merely emulating existing fuels, as is largely the case with existing biofuels from food crops. Instead we can develop new fuels that have been intentionally designed for sustainable production, to release energy more efficiently and emit lower levels of pollutants. What can you tell us about Biobean? 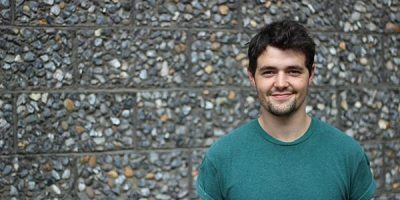 Bio-bean are an exciting green energy company, founded by two UCL graduates and developing sustainable fuels from used coffee grounds. Coffee beans naturally contain oils that have potential as biofuels, and these remain bound in the coffee grounds even after the brewing process. With PhD student Ioannis Efthymiopoulos, we are working on developing energy efficient methods of extracting these oils and using them as sustainable biofuels for internal combustion engines. When not immersed in cutting edge science where would we find you , and what would you be doing? As an engineer I have a natural weakness for attempting the rescue and repair of unloved bicycles and electric guitars – most of the bikes have got me around ok, but not all of the guitars have sounded that great!